Three decades ago, Prime Minister Margaret Thatcher implemented a policy called “privatization” to rejuvenate the moribund economy of the United Kingdom. Like the United States today, the cost of a too-large government was sapping the vitality of the U.K.’s economy. The private sector was staggering under the heavy tax burden needed to fund the public sector. In fact, despite very high tax rates, taxation could not keep up with government spending, so the Bank of England (the U.K.’s central bank) created more money (what we euphemistically call “quantitative easing” today) to make up the difference. Prime Minister Thatcher’s solution to this untenable situation was brilliant and elegantly simple: She decided to divest the government of its nationalized businesses by selling them to private investors—i.e., privatization. This shrank the budget deficit dramatically, first, by shrinking expenditures, since the government would no longer have to fund those businesses, and second, by increasing revenue. Revenue was increased both immediately, via the price paid by private investors for government assets, and on an ongoing basis, as private firms and their employees became net taxpayers. 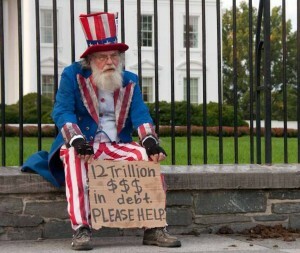 Given the federal government’s gargantuan debt and deficits, H.R. 1734 should be a no-brainer, a slam-dunk. One would expect any member of Congress who professes any concern for fiscal responsibility to vote for this bill. Nevertheless, the bill is flawed. Selling properties outright is a great idea, but is “redeveloping … properties and consolidating … space” a great idea? Sorry, but I have no confidence in Washington’s ability to manage resources efficiently. Just sell the stuff and let private-sector experts in property management figure out how to make economic use of those properties. Hopefully, H.R. 1734 would be a first step in a much larger privatization process. While the United States doesn’t have a large inventory of nationalized industries to privatize like the U.K. did in the ’80s, there are many assets that Uncle Sam could sell to the private sector to start reducing the national debt. First, Uncle Sam could divest itself of vast swaths of federally owned land. Surely, the government needs nowhere near the 30 percent of our national territory that it owns. Second, privatize AmTrak; privatize the Post Office and rescind its monopoly privilege; and completely privatize government-sponsored enterprises, so the taxpayer doesn’t get stuck with any more Fannies and Freddies. Third, privatize the Government Printing Office and any other federal agency or office that unfairly competes with unsubsidized private companies. Fourth, privatize any government activity that profits private businesses: energy research, the Export-Import Bank, the advertising programs in the Department of Commerce, etc. At a time when many large American corporations are sitting on record amounts of cash, we don’t need to increase the national debt to subsidize them. Fifth, whether you can find a bidder or not, quit funding the PR and grant-bestowing desks in federal agencies. Their main function often is to use our tax dollars to promote their own expansion. If federal employees want to toot their own horn or give money to non-profits who will do their lobbying for them, let them do it on their dollar, not ours. Finally, don’t waste time trying to reform bureaucracies or make them more efficient. Only the profit-and-loss calculus in competitive markets can do that. Put any federal agency on the block if it is performing a function that conceivably could earn a profit, and sell it to the highest bidder. (If there are no bidders, you’re looking at an economically unviable operation, so axe it—unless our lives depend on it.) If an agency isn’t fulfilling its purpose, and its primary function seems to be to provide well-paying jobs to otherwise unemployable holders of undergraduate and law degrees, then just pull the plug and abolish it. Let’s hope that the whiff of privatization leads to far more than selling a few unused properties, and that there’s real movement toward shrinking the federal government by privatizing many of its properties and activities.